Please join us for a fascinating and inspiring evening where we review the last 12 months of citizen science frog monitoring along Dandenong Creek. Citizen scientists (largely from the First Friends of Dandenong Creek) have put in a magnificent effort during 2017/18, with a total of 197 Frog Census reports submitted. We will discuss what these records are telling us, including some significant new records, and learn about each of the frog species detected. 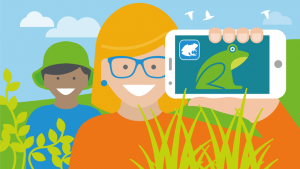 We will also take the opportunity to acknowledge the wonderful efforts of the citizen scientists participating in the Frog Census program, and provide information for anyone new who might like to get involved. This event is being jointly hosted by Living Links, Melbourne Water and the First Friends of Dandenong Creek. It is being supported by the Victorian Government’s Our Catchments, Our Communities initiative, through the ‘Transforming the Dandenong Creek into a world class urban Living Link’ project. A light supper will be served from 8pm following the presentations. Image supplied by Melbourne Water.